The Microsoft Surface adapter kit provides the connections you need while on-the-go for your Surface Pro 2, Surface 3, Surface Pro 3, Surface Pro 4, and/or Surface Book. Bringing your own device to a meeting or presentation is an everyday occurrence, being able to connect to nearly any display is crucial. 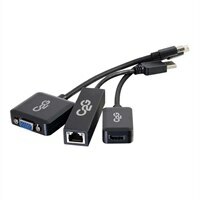 The Mini DisplayPort to HDMI and Mini DisplayPort to VGA adapters allow the Microsoft Surface or Surface Pro to connect to a VGA or HDMI input of a projector, monitor, or HDTV. The Gigabit Ethernet adapter offers up to 1000Mbps over Ethernet to nearly any desk, terminal, or office. Whether you are out in the field presenting or at home streaming movies this adapter kit brings you the light-weight, portable, and simplified connectivity that you need.